I have pictures of toilets and other plumbing from all around the world. Not every country, but every country I have visited and taken pictures. The current list includes: Belgium, Britain, Bulgaria, China, Czech Republic, Egypt, France, Greece, Greek Islands, Hong Kong, Hungary, Italy, Japan, Latvia, Mexico, Netherlands, Romania, Russia, Syria, Trinidad, Turkey, and U.S.A..
Click on any of the pictures to be taken to detailed pages for the toilets of that country. These open-air toilets are on the side of Saint Catherine's Cathedral in Brussels, Belgium. Other Belgian plumbing details shown on the dedicated page include a second cathedral, this one in Saint-Hubert in the Ardennes region of southern Belgium, with a sign prohibiting urinating against the side of the church. There is no single rule in Belgium about church urination; sometimes it is encouraged and sometimes it is prohibited. A picture from the Mappa Mundo bar in Brussels shows the typically Belgian open urinal and common washing area. There are pictures of toilets on board Belgian trains, from the high speed Thalys to regional trains in the Ardennes. Finally, I have a separate page dedicated to the peeing statues in Brussels shows the famous Mannikin Pis or Peeing Boy statue. That's right, a small statue of a peeing boy is one of the most popular tourist attractions in Belgium. Mannikin Pis has recently been joined by Jeanneke Pis, the Peeing Girl statue, and Zennike Pis, the Peeing Dog statue. They are all plumbed for realistic operation. Britain is a diverse island, with three nations (England, Scotland, and Wales) and history going back to the Stone Age. These toilets are from the Roman fortifications at Vercovicium Fort, a part of Hadrian's Wall, in northern England. 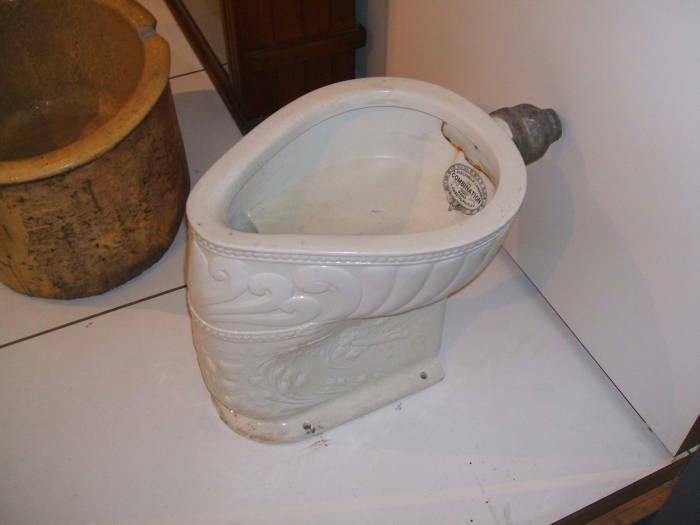 This toilet is much more recent, but it still dates back to the 19th Century. It is in a museum display case, as it's an example of 19th Century Scottish industrial output at the National Museum in Edinburgh. The dedicated British toilet page has, of course, lots of pictures of toilets in British pubs, trains, buses, and ferries. But my British toilet collection is broader than most, as it includes plenty of historical British plumbing. The earliest British toilets may be some of the most ancient toilets in existence. The Neolithic settlement of Skara Brae is on the Orkney Islands north of Scotland. The settlement includes what are believed to be toilets attached to each of the eight interconnected dwellings. Skara Brae dates back to 3500-2100 BC. Moving forward in history, you can also see Arthurian toilets at the monastery in Glastonbury, and toilets at the Saint Andrew Cathedral Priory in Scotland. Much more recent British examples include the toilet at the World War II bunker tunneled into the White Cliffs above Dover, and Winston Churchill's chamber pot. Bulgarian toilets used to have a bad reputation, but these days they're quite nice. This first one is in the upstairs dorm at the Be My Guest hostel in Sofia, Bulgaria. Notice the stylish vessel sink. Toilets in Bulgaria often seem like those in trendy bars and restaurants in New York. 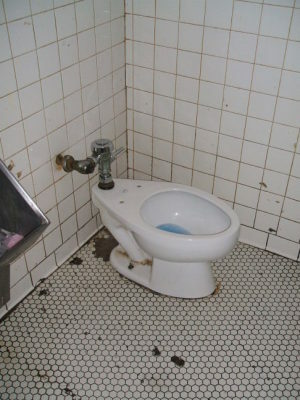 If you insist on seeing a picture of a bad Bulgarian toilet, here is one. However, this one is decommissioned, awaiting repair and replacement. It is in a closed public toilet in Велико Търново, or Veliko Târnovo. 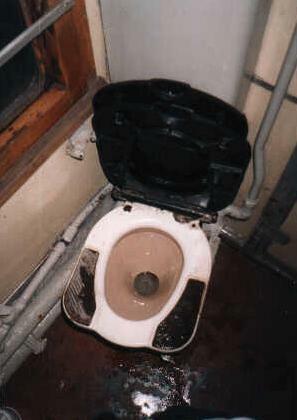 The dedicated Bulgarian toilet page has other pictures of toilets, sinks, and showers in Sofia and Veliko Târnovo, and also on board Bulgarian trains. 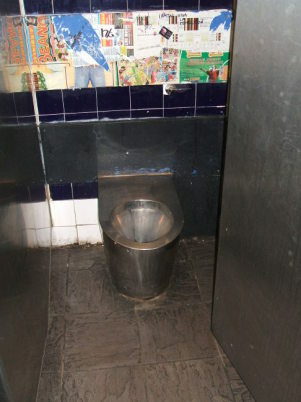 Chinese toilets, at least those in the People's Republic of China, can be highly communal. There is no place for privacy in a totalitarian state striving for the completely collectivist society. These are in Guangzhou, the large city formerly known in the West as Canton. Places catering to foreign visitors, like Yangshuo, in Guangxi Province, can be a little nicer. 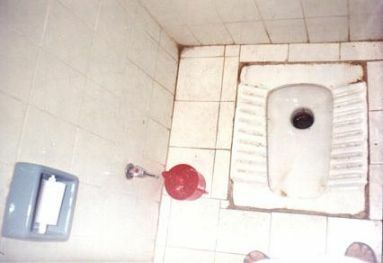 This Yangshuo squatter is nice and highly westernized, as far as Chinese toilets go. The Chinese toilet page has other pictures of public toilets in Guangzhou and Yangshou, and on board Chinese trains. Czech toilets are pretty standard Central European models. To mix things up a little, here are the entrances to the public toilets in the Prague Metro system. The dedicated Czech plumbing page shows more Czech toilets, sinks, and showers. 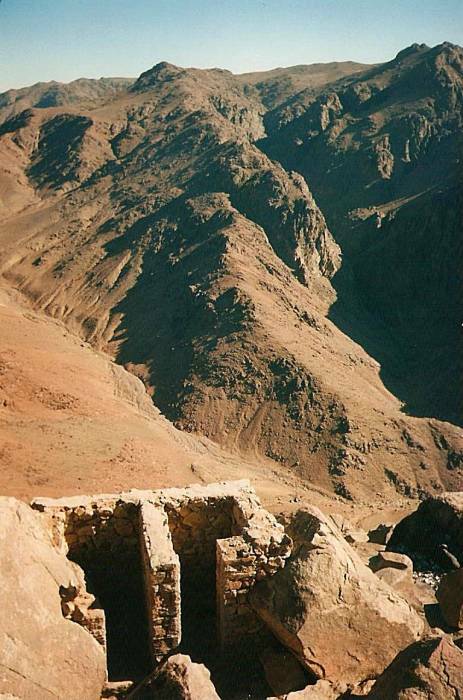 This pit toilet is constructed from local rubble, just below the summit of Mount Sinai in Egypt. 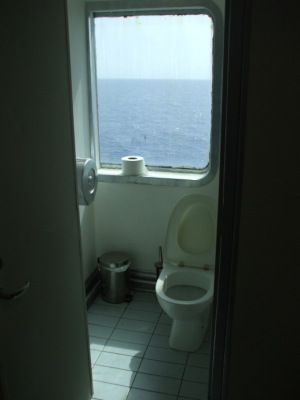 This rusted aquatic squat toilet is on an Egyptian ferry on the Nuweiba-Aqaba route between the Sinai and Jordan. Other Egyptian toilets in my collection include one at the Muhamed Aly camp at Dahab, in the Sinai, and one from an express train on the Aswan-Luxor-Cairo route paralleling the Nile. 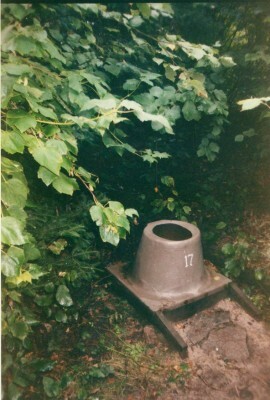 France is famous for having developed the modern self-contained public toilet, like this example in Paris. An alternative is to visit a brasserie. You will quite likely encounter squat toilets in smaller brasseries and bars. 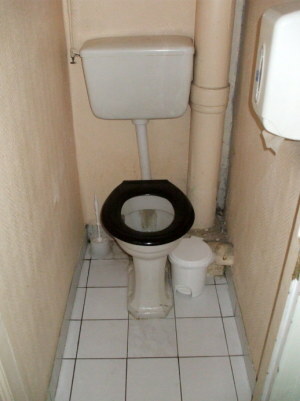 There are many other examples shown on the dedicated French toilet page: public pissoirs, examples of the toilette au couloir or the shared toilet down the hall in cheaper hotels, and basic toilettes and toilettes turques (that is, "Turkish toilets" or squat toilets) in bars, brasseries, churches, and monasteries. Separate pages detail Jim Morrison's bidet and a tour through the famous Paris sewers. The Greek mainland has some pretty nasty toilets. The first one shown here is in Nafplio, south of Korinthos in the Peloponnese. Squat toilets may be preferable, as they have the potential to be cleaner. At least you can just hose them down. This bright orange example is in a taverna in Kastraki, near the mountaintop monasteries of Meteora. The detailed page of Greek toilets includes examples from Athens, Korinthos, Olympia, Thessaloniki, and Kalambaka, and on board Greek trains. The Blu-Blu cafe / lounge / bar / Internet cafe is a nice place on the island of Mykonos. You can get on the net or transfer pictures from your camera to a USB stick. And, while you're there, use the toilet and wash your hands. Visiting the Greek islands means traveling between the islands on the ferries. This scenic head is on board the F/B Artemis en route from Ios to Santorini in the Aegean. Other Greek island plumbing shown on the dedicated page are from Ios, Mykonos, Santorini, Samos, Rhodes, and Kos. 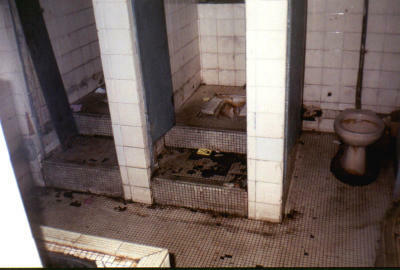 These are the lovely public toilets in the Chungking Mansions on the Kowloon side of Hong Kong. The Chungking Mansions are a dilapidated tenement block. The upper floors contain several budget guesthouses and some really good curry shops. 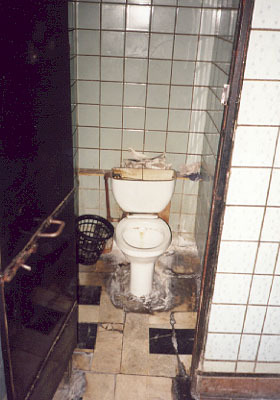 The Chungking Mansions are a fine place to eat and sleep, but the public toilets are dire. The Hong Kong toilet page has some more pictures of the Chungking Mansions, and links to lots more pictures from my trips to Hong Kong. This bright green public toilet is in a small neighborhood park in Budapest. Magyar, the language spoken in Hungary, is unlike any other European language. The words for Men's and Women's are Férfiak and Nök, respectively. At least the word for Toilet is the obvious Toalett. The Hungarian toilet page has pictures of toilets, tubs, and sinks in Budapest, and of washrooms on board Hungarian trains. Italy is another place with ancient toilets. 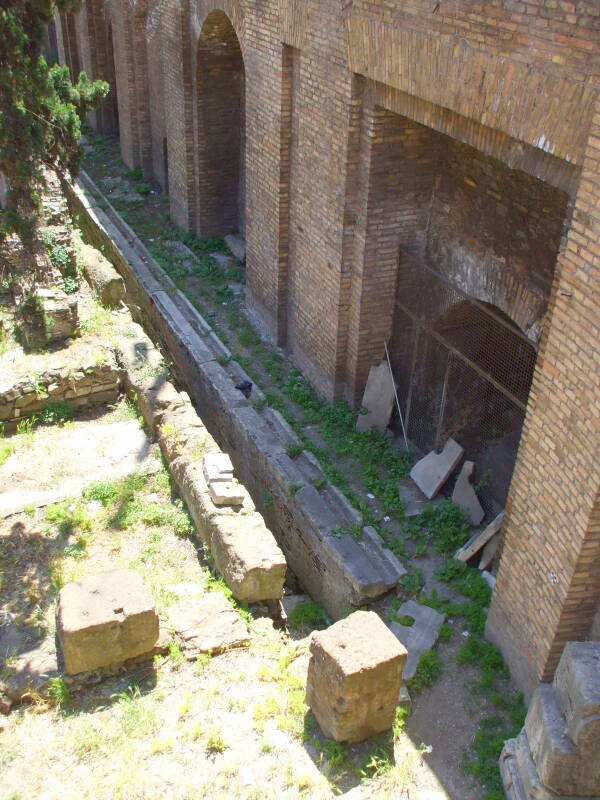 The first one shown here is the public latrine next to Pompey's portico in Rome. This portico was used for meetings of the Roman Senate, and is where Julius Caesar was assassinated on 15 March 44 BC. 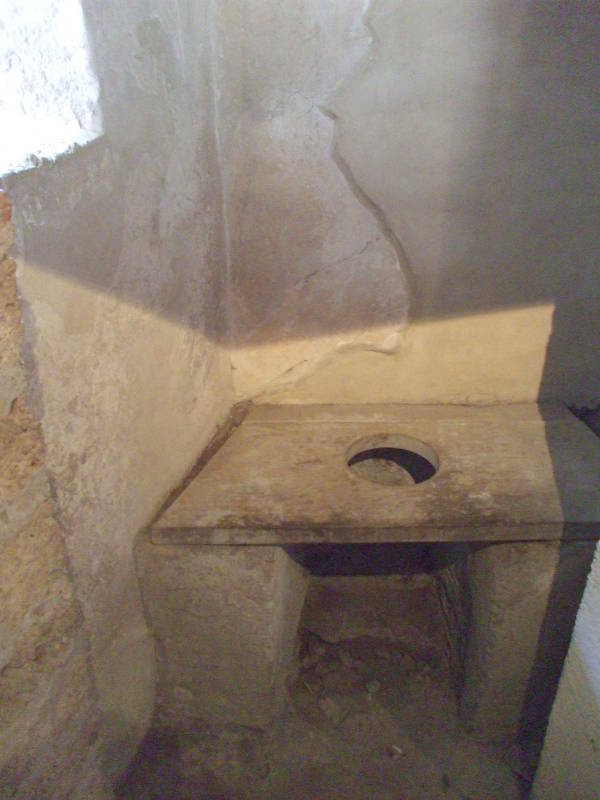 The second is the indoor toilet from the famous two-story brothel, the Lupanaro, in Pompeii. Other Italian toilets and other plumbing shown on the dedicated page show an Italian truckstop toilet, toilets in Rome, Perugia, Genova, and the Vatican, plus several toilets on board Italian trains. Other ancient examples are those from Paestum and the Roman Emperor Nero's Toilet at Villa Poppaea, at Oplontis. Toilets in Japan often have a wide range of advanced features, including electrically heated seats, and complicated built-in bidet and air-drying functions. Often you are mystified by an array of buttons with cryptic symbols. The bathrooms at Tokyo's Haneda Airport have placards explaining the controls in three languages — Japanese, English, Chinese, and Korean. Of course, these are the symbols for this one manufacturer's system. Another company's toilet likely has entirely different symbols on its controls. 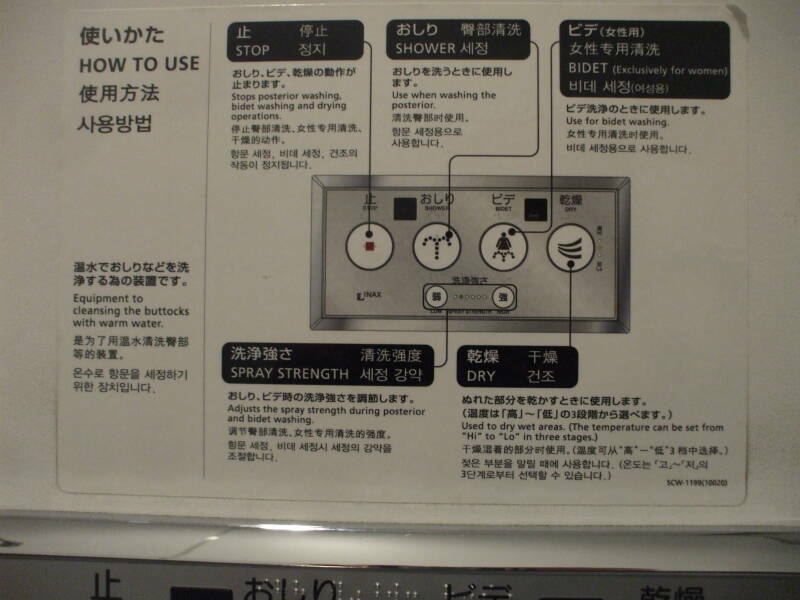 I have a series of pages explaining Japanese toilets, including the complex multi-function control panels, and how a standard was published so that all systems manufactured after that date would have a common user interface. There are are details and lots of pictures on the range of toilet designs, from simple squat toilets to elaborate raised commodes. Also, toilets on board trains including the high-speed luxurious Shinkansen bullet trains. And, a page on the Kappa, a Japanese water demon believed to come up through your toilet and attack you. Learn how to avoid an attack, and make the Kappa into your slave. This Latvian passenger car on the Riga-Tallinn line was built in Russia, back in the days of the Soviet Union. Note the footpads. Most Soviet rail cars were built to all-USSR standards. This feature was for Central Asian use. Lower the seat and it's a raised throne. In the configuration shown, it's an elevated squatter. Here are the toilet, sink, and tub in a room at Hotel Isabela in Mexico City. You can tour Leon Trotsky's home in Mexico City. Among the sights are the exiled Russian revolutionary's toilet, tub, and hot-water heater. 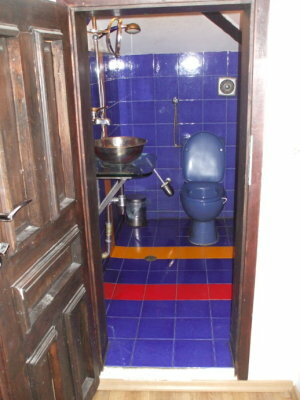 The Mexican toilet page has more details on both of these, and it also shows some plumbing in a budget hotel in Tecate. This Dutch urinal at Amsterdam's Schiphol Airport is one of the most famous urinals in the world. The dedicated Dutch toilet page has a close-up picture of the fly. This glow-in-the-dark facility is at the Homegrown Fantasy coffeeshop in Amsterdam. It's very psychedelic, but blacklight toilet illumination is generally done to prevent the use of intravenous drugs. You can't see your blood vessels under nothing but ultraviolet or just deep blue lighting. This is the new design for public urinals along the streets in Amsterdam. It's a plastic unit with a steel hook at the top to move it. And yes, this is all there is to it. It's awfully close to just peeing on a lightpole along the street. "Performance anxiety" can be a problem. Note the blue border, I know what I'm talking about. Other Dutch toilets shown on the dedicated page include those at the Bulldog coffeeshop, other street urinals, and a strange monumental arch with a dramatic inscription about urinating into the wind. I was coming into southern Romania by train from Bulgaria. That brings you into the vast Romanian oil fields, starting pretty soon after you cross the Danube River, and continuing past Bucharest and Ploeşti to the southern Carpathian Mountains. So yes, you expect to see oil wells and pumps, and pipelines, and power lines to run the pumps. These public toilets are at the train station in Gura Humorului, in the Bucovina region in north-eastern Romania. Other Romanian toilets on the dedicated page include several in Bucharest (or Bucureşti as the locals know it), some very nice toilets and sinks in a wonderful guesthouse in Gura Humorului, a dire squat toilet at the Moldoviţa Monastery, just outside the small town of Vatra Moldoviţei. at the train station in Suceava, in Bistriţa, in Sighişoara, and on board Romanian trains. This toilet is in a ward hallway in Hospital #122 in the Name of Sokolov in Sankt Peterburg, Russia. Notice the open plumbing chase. It is used by patients to dispose of empty vodka bottles, newspapers, and cigarette butts. Many plumbing chases in the hospital have experienced minor flue fires. This is a public toilet in a train station in Moscow, Russia. Note the standard Russian lack of seat, just a refreshingly cool porcelain bowl. It's especially bracing during those chilly Russian winters. Also notice the prison-style door. It's far scarier in person, as there is no lighting and one experiences the fear of the unknown. Other Russian toilets include a toilet and shower in the Postgraduate Nursing School affiliated with Hospital #122 in the Name of Sokolov, a staff toilet in that hospital, and a couple of Russian train toilets. Here we see a long-haul Syrian bus making a toilet stop along the road from Damascus to Aleppo, Syria. This is probably close enough for photography, Syrian bus stop toilets can be grim. Many of the bars in Trinidad have enormous tank-like urinals. The only other plumbing in the room is the sink, so it's pretty obvious that the large trough is the urinal. But it still seems like you're doing something you probably shouldn't. This on is in the 52 Bar along the Western Main Road in Port of Spain. 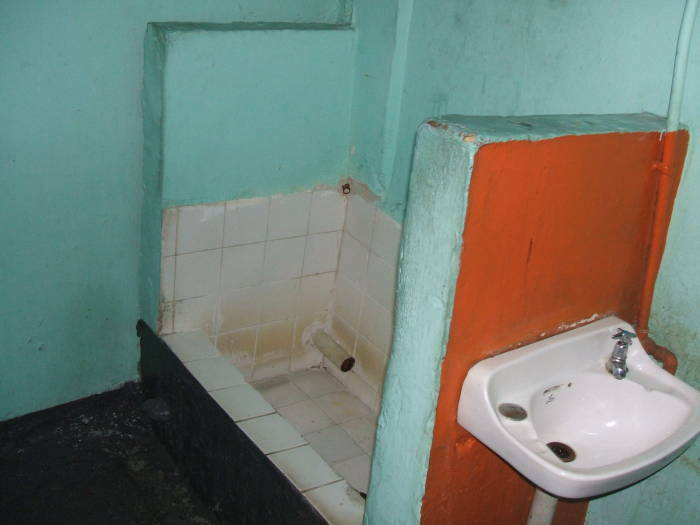 The Trinidad toilet page also shows a toilet, tub, and hot water heater in a budget guesthouse in Port of Spain. This efficiently designed bathroom is at the Köse Pension in Göreme, in the Cappadocia region in central Turkey. It's a classic floor-mounted squatter with integrated plumbing. The shower head mounts on the wall of the room, and the toilet drains the entire room. The hose/sprayer also reaches the toilet itself for hygenic purposes. This classic Turkish squat toilet is at the fabulous Doy-Doy Restaurant in the Sultanahmet district of İstanbul. Other Turkish toilets on exhibit on the dedicated page include both squat and raised throne toilets in İstanbul, Konya, Pamukkale, Olimpos, and Selçuk, at some anonymous bus and truck stop in central Turkey, and an open-air squatter in Beşparmak Dağları, the Five Fingers mountain range. Plus, of course, Turkish trains. Harry's Chocolate Shop is actually a popular bar just off the Purdue University campus in West Lafayette, Indiana (and just a few blocks from my home). The men's toilet off the main bar area downstairs is seatless and pretty nasty. The Corcoran Gallery of Art is just a few blocks away from the White House in Washington, D.C. The Corcoran has some of the big old trumpet shaped urinals from the 1930s or 1940s. The patterned hexagonal tile floor also looks appropriate for that period. The American toilet page has many more examples. This pit toilet in the Boundary Waters Canoe Area Wilderness in Minnesota is by far the most rustic. Other American toilets for your viewing pleasure include ones at cheap restaurants in New York, Washington, and Indiana, at a truck stop, at Purdue, M.I.T., and Harvard University, at the U.S. Department of the Interior, at Venice Beach, at Minneapolis-St Paul Airport (where U.S. Senator Larry Craig was arrested for soliciting sexual favors), and on board aircraft, trains, buses, ferries, and even spacecraft.